I try to buy British whenever possible. Not because I am excessively patriotic or xenophobic, but simply because it seems to me buying locally produced goods must be better for the economy. Recent news that the economy might be slowly recovering on the back of a consumer boom would be so much better, surely, if it was on the back of a consumer boom in British goods. Last week in London, I searched out a shop selling British made jeans. All well and good, except they didn’t have my size nor is there currently any stock to be had by ordering online. Can’t fault them for that, hopefully they will soon have produced new stock and I can then get hold of a pair. I am getting too old for the holes-in-jeans look! Trying another shop that proudly refers to ‘London’ on its label, the shop assistant pointed out one pair of jeans that was ‘made in the UK’ while another pair, somewhat cheaper, was ‘made in their Chinese factory’. But once again my size wasn’t available. This turned out to be a close shave though, as when I spoke to their head office to see if my size was available online, the previous information was corrected to say that both styles were produced in China. Can’t buy British there then. Obviously, any company is entitled to make its products wherever it likes, but I do wish that brands that proclaim their ‘Britishness’ could at least make it clear where their products are made. A bit more staff training might not go amiss. And if more people take the trouble to ask where products come from, manufacturers will hopefully provide more information. 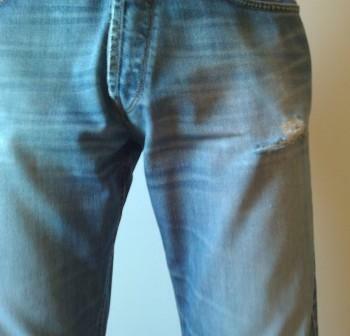 I suppose I will have to wait to get my hands on a new pair of jeans made in Britain and, in the meantime, my money is burning a hole in my pocket – to join the other holes – rather than helping the economy. UPDATE: Since posting this blog, I managed to get a pair of jeans when I next went to the shop. And more recently, a new brand of English menswear has hit the scene. Take a look at http://www.quantockclothing.com/jeans. I’ve not tried them yet, but great to see them! This entry was posted in Blog, Brand on December 4, 2013 by Sean.